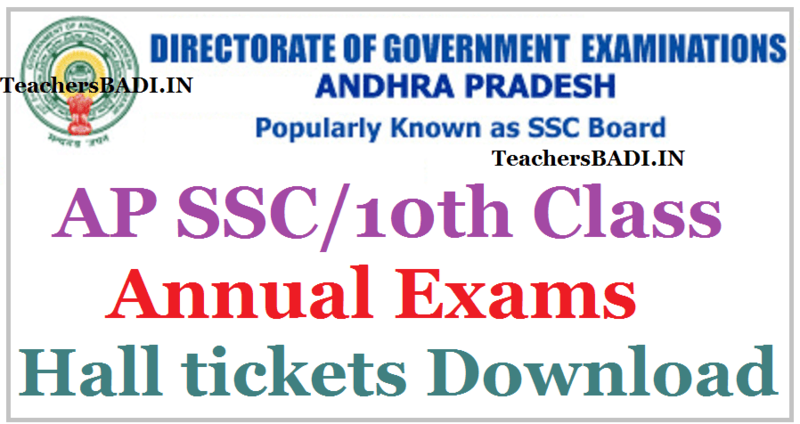 Download AP SSC (10th Class) March 2019 Hall Tickets: The Board of Secondary Education, Andhra Pradesh announced the SSC Public examinations Time Table in December for the year 2019. The BSEAP clearly indicated that the students of the entire state(Andhra Pradesh and Telangana) may have follow the same methodology. The admit cards for the class 10 SSC board examination would be released by the Andhra Pradesh Board of Secondary Education (BSE Andhra Pradesh). The admit cards are available now for the candidates on to the official website of AP BSE. The first exam will be on March 15 with First Language (Paper-I) and it will end on March 16 with Vocational Course (Theory) paper. The SSC Public Exams will be start from March 18, 2019 including other exams. All exams will be held from 9.300 AM to 12.00 Noon. This academic year approximately 1.5 lakhs students will be attended to SSC Pubic examinations March 2019. BSEAP Officials has declared to download the SSC Public exams March 2019 Hall Tickets from its Official website www.bseap.org. Candidates can download their SSC March 2019 Hall Tickets from BSEAP Official Website. Step 1: First please visit the BSEAP Official website : http://home.bseap.org/ or Open the following given below appropriate Hall Ticket Download links. Step 2: Please select your district name. Step 5: and click on Download Hall Ticket Button. Note: Please visit bseap official website, if above provided links are broken..